The textbooks and journals (and especially the oil companies) said making a completely recyclable, biodegradable, petroleum-free polymer couldn’t be done. But Colorado State University chemists have done it — paving a potential new road to truly sustainable, petroleum-free plastics. Just reheat is for an hour and it converts back to its original molecular state, ready for reuse. Their starting feedstock: a biorenewable monomer that textbooks and journal papers had declared non-polymerizable, meaning it could not be bonded into the large molecules (polymers) typically required for use as a material. Plastics are the most common type of manmade polymer, which is the chemical term for a long chain of repeating small molecules, or monomers. Petroleum-based polymers like polyethylene and polystyrene have come under fire for piling up in landfills and even in oceans. There are several biodegradable plastics on the market today, chief among them a starch-based material made from polylactic acid, or PLA. Compostable cups, cutlery and packaging in dining halls are made from PLA. They’re biodegradable, but they’re not truly recyclable — once made, they can’t be completely reconstituted into their original monomeric states without forming other, unwanted byproducts. The researchers’ starting monomer is gamma-butyrolactone, or GBL. It is a colorless liquid and common chemical reagent, derived from a biomass compound best suited to replace petrochemicals, according to the Department of Energy. Textbooks and scientific literature had described these small molecules as thermally stable in their monomeric chemical states could not polymerize. But Chen and Hong figured out how to get this material to take different shapes, such as linear or cyclic, based on the catalysts and conditions they selected. They used both metal-based and metal-free catalysts to synthesize the polymer, called poly(GBL), which is chemically equivalent to a commercial biomaterial called poly(4-hydroxybutyrate), or P4HB. 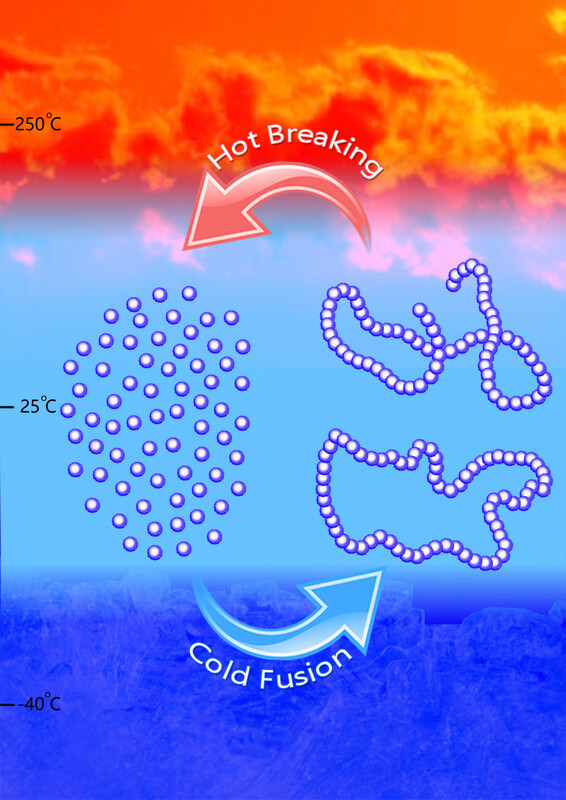 To convert the polymer back into the original monomer, demonstrating the thermal recyclability of the polymer, they employed specifically designed reaction conditions, including low temperature, to make the polymer, along with heat between 220–300 degrees Celsius. P4HB is derived from bacteria, which is a more expensive, complex process than how most plastics are made. Instead, by starting with the readily available GBL and ending up with a replacement material for P4HB, Chen’s discovery has promising market potential, and a provisional patent has been filed with the help of CSU Ventures. Ring-opening polymerization (ROP) is a powerful synthetic methodology for the chemical synthesis of technologically important biodegradable aliphatic polyesters from cyclic esters or lactones. However, the bioderived five-membered γ-butyrolactone (γ-BL) is commonly referred as ‘non-polymerizable’ because of its low strain energy. The chemical synthesis of poly(γ-butyrolactone) (PγBL) through the ROP process has been realized only under ultrahigh pressure (20,000 atm, 160 °C) and only produces oligomers. Here we report that the ROP of γ-BL can, with a suitable catalyst, proceed smoothly to high conversions (90%) under ambient pressure to produce PγBL materials with a number-average molecular weight up to 30 kg mol–1 and with controlled linear and/or cyclic topologies. Remarkably, both linear and cyclic PγBLs can be recycled back into the monomer in quantitative yield by simply heating the bulk materials at 220 °C (linear polymer) or 300 °C (cyclic polymer) for one hour, which thereby demonstrates the complete recyclability of PγBL.